Prepaid International Sim Cards in India : Rates Comparison and Reviews | Free Pc to Phone Calls, Free Voip Calls to India International ! If you are a frequent traveler and loves going abroad from India, then you must have atleast heard about International Prepaid Sim Cards. If you are planning a trip outside India, one thing should consider is about "how are you going to connect with friends and family back in India". If you are planning to get your international roaming activated then you should surely needs to check the rates. Don't worry we recently reviewed all telecom provider charges for international roaming. You should read that post. Turns out that international roaming can prove to a very costly affair and you could end up paying 10K-30K for just 20-30 calls! What next, do I have an option. The answer is Yes. One of the most popular alternative to international roaming is getting yourself a international prepaid sim cards. We have already reviewed many of these cards (in the past), so this post is just to remind you about your options. Let me explain in very simple terms. When you buy a sim card (locally in India), your sim card is functional only in your area (city/state). When you go out of your state, you end up paying roaming charges. Same applies for International Calls (roaming) as well. But, how about you can buy a SIM Card in India itself and when you go abroad (to a say USA), you don't have to pay any roaming charges. This Sim Card can work anywhere in the world (terms and conditions apply : some countries**) and you don't have to worry about roaming and all. Also, these are prepaid cards, so you will get some talktime which you can use while you are abroad. Rest you can reimburse after you return. You can avail for post paid option as well. Call Charges are lower as compared to normal telecom provider international roaming. Works great anywhere in world. No tension about buying cards when you visit multiple countries. You can save about 80% as compared to international roaming rates. You get to choose from variety of options : depends whether the card is for personal use, business use etc. For Business purpose this is the best option. You may require special phones (with some cards). The sim card provider will charge some rental. However for some sim cards, you can buy it one time and keep it yourself, for others its like return when you are back. Charges vary accordingly. Rental may prove to be too high. When you are back, it needs to be returned. Some documents formality (though takes minutes). Before we go into detail about various prepaid sim cards provider. Lets talk about the calling and international sms rates in general. Offcouse the rates for specific card provider will vary (in rage of 10-20%), so do check the specific rates before actually buying a card. Please note that these cards may not work in all countries. Though these cover most destinations in the world including USA, UK, Canada, Europe, Singapore etc work just fine. Most of the time incoming Calls are Free (one of the main feature about these cards). 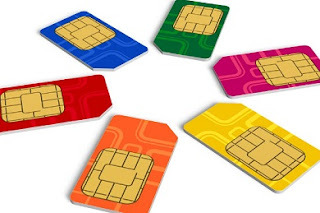 If you are traveling to only one destination, then consider country specific sim cards. Calls rates from USA to India are about 10-80 US Cents per minute. Approx Rs 4-40 per minute. Way cheaper than international roaming of Rs 150 per min. You need to buy these cards, which sot anywhere from Rs 500-Rs2000. Some offer cards worth Rs 3000 that includes data facility (internet on mobile). You can also try the sim cards which have rentals etc. No need to buy, just call a guy and get your card delivered at door step. When you are back, just return the card. This is the most popular option for prepaid cards. I am sure you must have seen their advertisement. Matrix offers country specific cards, all in one card (use anywhere). Matrix also has both the options that is, prepaid and post paid sim cards.They have rental plans as well. The calling rates are quite cheap as compared to others. They have grown quite big in less amount of time. They mostly target corporate customers. Check Matrix Sim Card Details. Airtel apart from its international roaming offer these sim cards named WorldSim. You can get this card at as low as Rs 500. The calling rates are about Rs 35 per min (USA to India). If you are a airtel customer, then prefer this card instead of going for international roaming. You will save a lot. You will get to enjoy free incoming calls. Check for details about AirtelWorldSim. Not sure how good they are doing (site not working as expected). Clay also offers postpaid and prepaid cards. Benefit is that they offer data plans for roaming as well. Trikon is quite unusual. Trikon WorldWide Sim Cards actually pays you to receive calls on international roaming. You get UK number with free incoming in many countries. Trikon pay you US1c/minute to receive calls on many network. Check Details about this unusual Trikon Card. WowTel communication also offers such prepaid cards. The calling rates are way to cheap like 1-2 cents per minute to India. Only drawback, I see is that it is limited to few countries and they charge you for incoming calls as well.